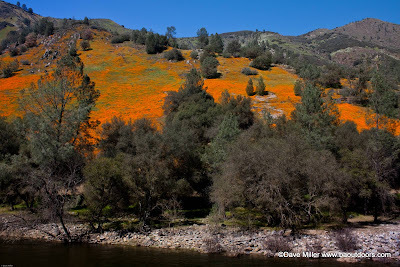 Bay Area Outdoors and Beyond...: Merced River Canyon - Oh Wow! Merced River Canyon - Oh Wow! There is a very special event happening right now a few hours drive from the Bay Area. 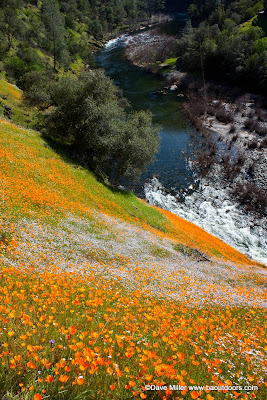 An explosion of wildflowers has erupted along the hillsides of the Merced River Canyon East of Mariposa along Highway 140. 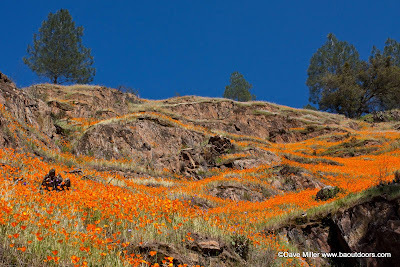 Some say they have never seen so many wildflowers in bloom along the canyon. Most of the Yosemite themed blogs that I follow (LittleRedTent, YosemiteBlog, Michael Frye Photography, etc) have been touting the proliferation of color for the past week or so. I finally couldn't take it any longer and took a day off of work (I was maxed out on my vacation time and had to take a day off anyway) so I could seek out and try to experience the massive quantities of California Golden Poppies I have been reading about. I was also aware of a storm coming this weekend and chances are many of the poppies would start losing their petals after the first rain. I couldn't let that happen without seeing them in full bloom first. My day started pretty early, 3:45 am. Of course, I really didn't get much sleep either because of my anticipation of what I would discover (and not wanting to oversleep). I had packed the car the night before (but still forgot the bag with all my camera filters, dang!) so I was out the door before 4:00am. Of course, morning is not the right time to photography wild flowers, especially poppies, since they don't open up unless the sun is out. 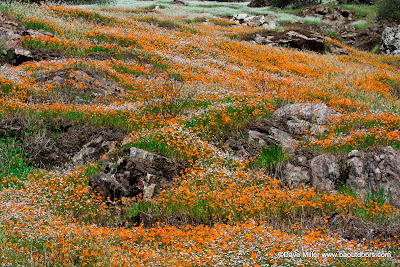 My plan (because I am a planner), was to head to the valley for some morning sunrise shots, then out along Hwy 140 for the wild flowers and then back to the valley for some late afternoon and sunset shots and then home. I thought it was a good plan, and it was! I arrived in the valley about 7:40am and played around at Cathedral Beach and the Swinging Bridge and Sentinel Bridge and Yosemite Falls. All wonderful and beautiful places for photography, but not really my what I was after. I was coming back from the short hike to Lower Yosemite Falls just before lunch time and decided the sun had been out long enough and I couldn't wait any longer so it was time to take a drive. There were two places I had scoped out(with the help of Michael Frye's The Photographer's Guide to Yosemite), Incline Road and Hite's Cove Trail (did I mention I was a planner?). My first stop was Incline Road, a narrow (very narrow in parts) frontage road that parallels Hwy 140 on the opposite side of the Merced River for a few miles. To get to Incline Rd from Yosemite Valley, turn right on Foresta Rd and then a quick left after you cross the bridge. It only takes about 15 minutes (give or take) to get there from the Valley Entrance. Following Incline Road will immediately provide lots of golden eye candy on the steep hillsides on your right hand side. I stopped at one of the first spots on the side of the road where my car would fit and jumped out with camera and tripod in hand. I travelled the road on foot and by car for a couple of hours, but I only got about a mile in. Not all the best scenes were right along the road, some places you had to work for. 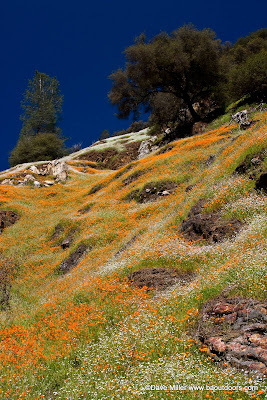 The steep hillsides are a challenge to navigate, especially carrying the camera gear and not wanting to casue any damage to the flowers, but I saw an incredible carpet of glowing gold up higher on the hillside beyond a tangle of fallen and live oaks. It was well worth the scramble. So many flowers so little time. I could have spent the whole day along that stretch, but wanted to see more. I then headed out to the Hite's Cove Trail a bit further down Hwy 140. The trail head for Hite's Cove Trail is at the Savage's Trading Post. 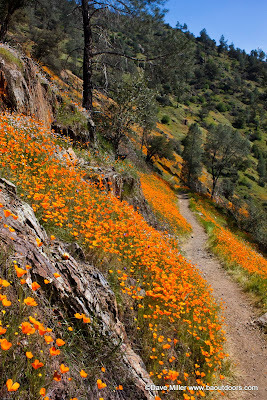 Although the whole trail is 4.5 miles, the wildflowers are in the first two miles and the best display is only a hundred yards up the trail. There was so much to see there, I really didn't go further than a quarter mile in. However, I do plan on hiking the whole trail in the future. Although the poppies may start to fade, others will start to take their place. 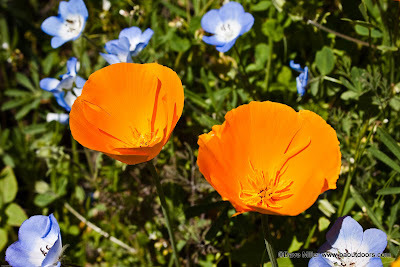 The California Golden Poppy was by far the most prevelant, I must have seen 6 or 7 different types of wildflowers on my trip. 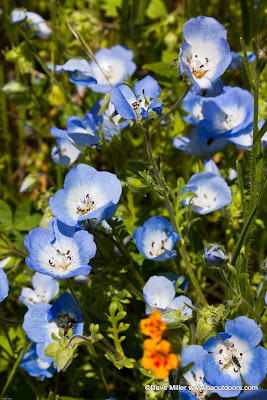 There is still plenty of time this spring to get your fill of wildflowers. 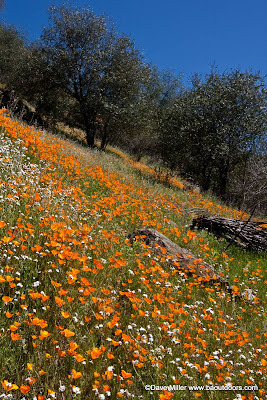 You can keep track of the status of California wildflower locations at the California Wildflower Hotsheet. This was a great trip and experience. Normally, I get excited about going to Yosemite, but this was extra special. I encourage you to go out and see some of the incredible color out there this Spring (I love it when a plan comes together!). I want to give a special thanks to Michael Frye who helped me refine my "plan". I also want to thank Edie at View from the Little Red Tent for the constant updates on the conditions along the Highway. I encourage you to check out their sites and galleries. They don't have to get up at 3:45am to get to the valley and I envy them for that. Use the map below to get directions to the two locations I visited. Below are more of my favorite photos. To see even more photos (and at a higher resolution), check out my new Photo Gallery. As always, your comments are encouraged and appreciated! How've you been? What have you been up to? Send me your email! Incredible photos. Thanks for sharing. Thanks Randy. I've been enjoying your updates too. 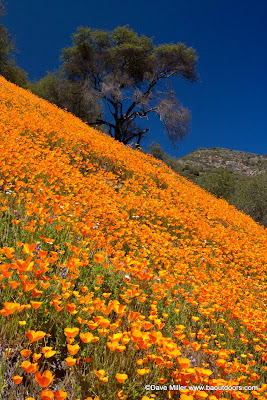 I am just learning of this now (April 15th) - do you think that the wildflowers are still as stunning if I would to go this Sunday? Not everything is right off the road and you may need to do some exploring, but it is definitely worth the effort. One caveat, I don't know how the recent rain and wind affected the wildflowers.